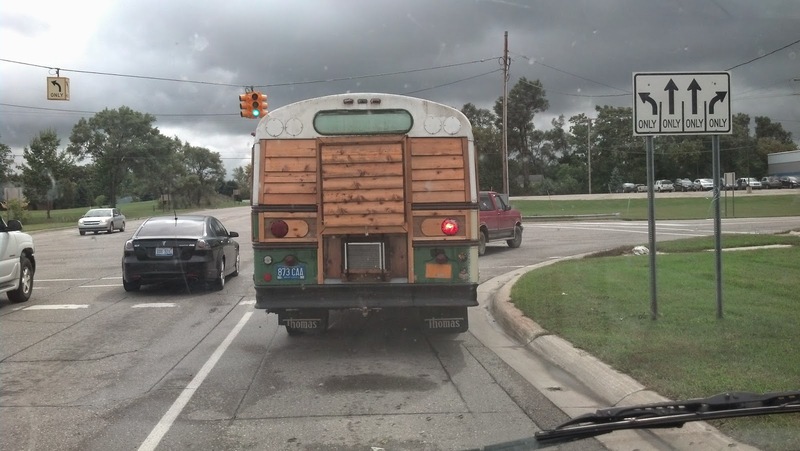 I ended up behind this old bus conversion a couple days ago. I was hoping they'd stop somewhere but they ended up getting on the expressway. Michigan doesn't issue that style license plate anymore so it's expired by at least 10 years. They must have just bought it or something. I've been starting to get the inside 'finished up'. I finally got the new wood cut and in place for the little corner spot there. Where the TV mounts to and the part next to the door. 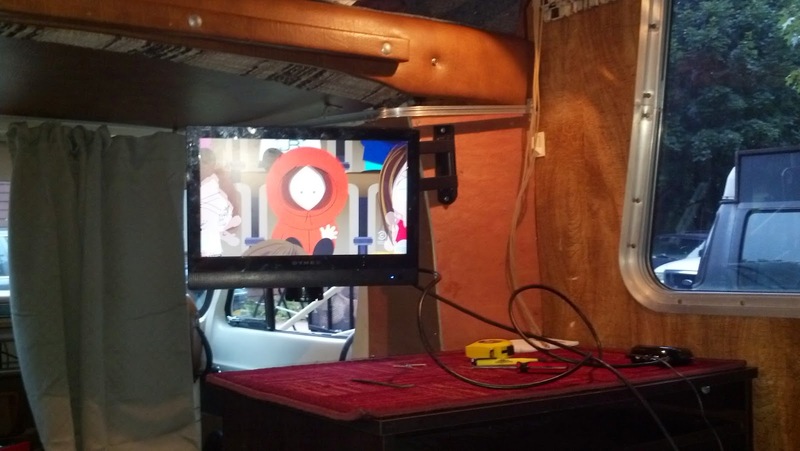 I also mounted the TV, which I really like. I still need to tie up the wires so they're neatly routed, and figure out where I want to keep the Roku. 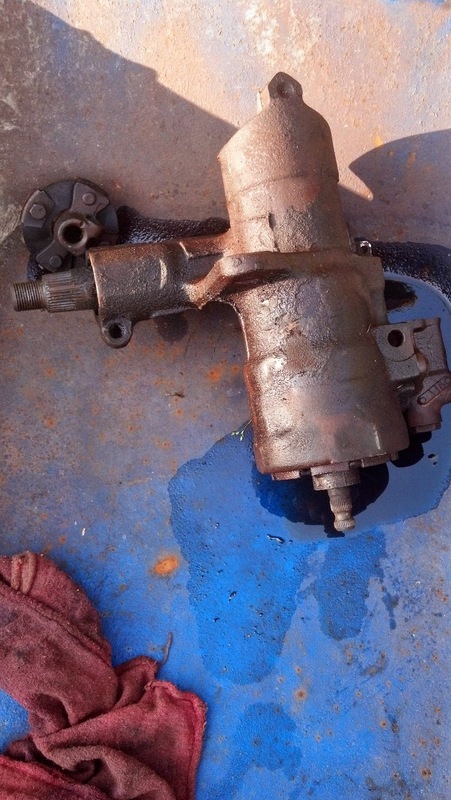 You blog readers finally scared me enough to swap out the old steering gear. I don't think it would have ever completely failed but still it was pretty loose. It was an easier job than I expected. I figured getting the pitman arm off would be the hardest part but I rented the puller from AutoZone for $15 and after spraying the threads with PB Blaster it came right off. The new one is very noticeably tighter. My only complaint is I miscalculated and the steering wheel is a little off center now but I'm already used to it. 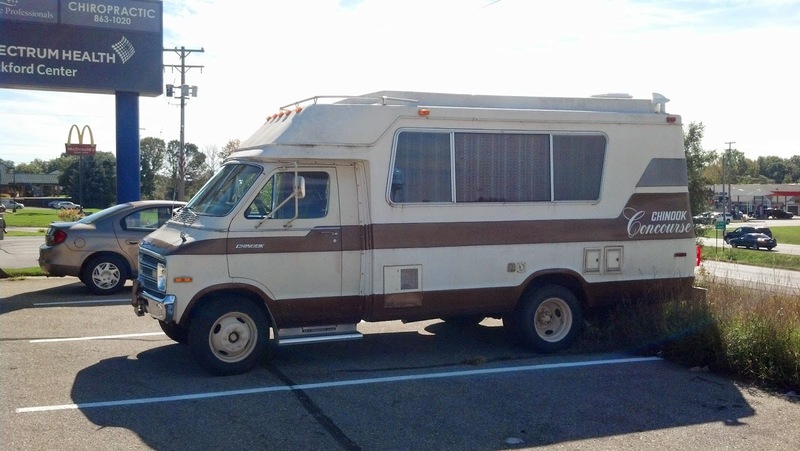 I've been driving the motorhome around more as my daily driver lately. The van's brakes are grinding again and I'm afraid that eventually the rotor is going to get so thin it'll just break in half. A sticky caliper is the issue, but I'm hesitant to put more money into the van because it's got a lot of issues and I plan to retire it soon. Also, there's a lot of extra weight in the van right now because I cleared out my storage unit. I'm still trying to find new places for everything. 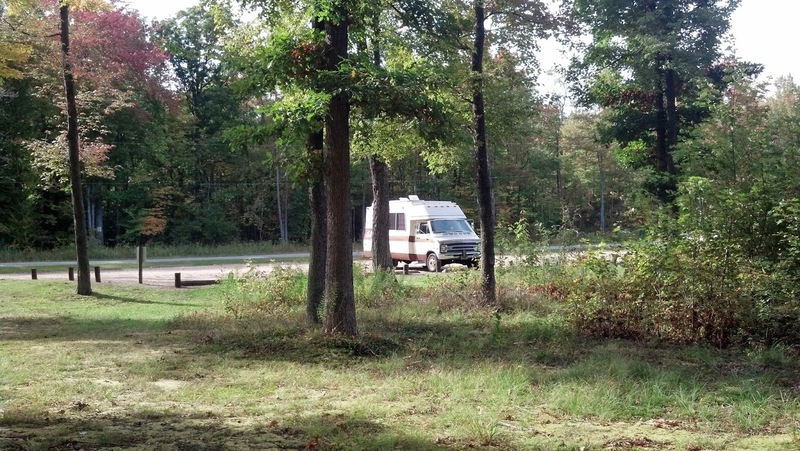 I'll finish up by leaving you with some pictures of the motorhome at the park I hung out at for a while the other day. I didn't even notice while I was there, but you can see the leaves are starting to change. Looking good man, Im starting the rebuild of my interior this coming up sunday, Ill have to send you some pics when Im done, but we're insulating the floors and walls, putting in new flooring and walls and then moving in hopefully by the end of Oct. Ill have to pick your brain in more detail about the steering fix, mine is badly in need before spring comes and we go mobile. Its awesome to see how inconspicous it truly is out and about in the world. Have you thought about just rebuilding the sticky caliper? The hardest part about it is getting the job done is bleeding the brakes afterwards. Sounds like a lot of work. I'm good at ripping things apart but not so good at putting them back together. 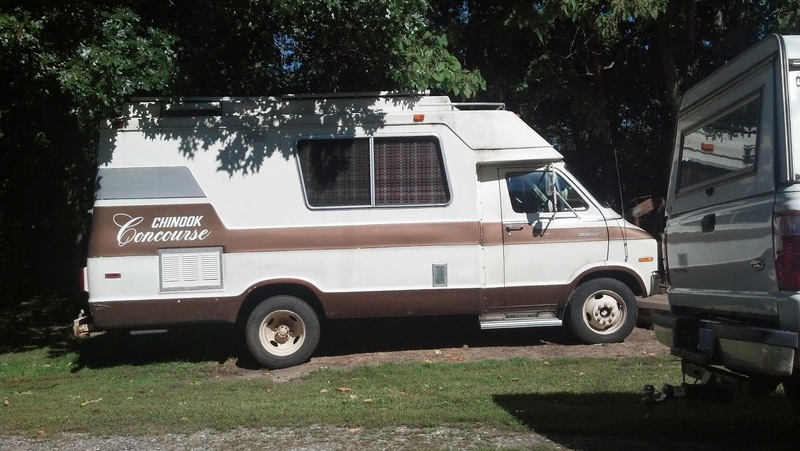 I learned that with a motorhome I used to have a long time ago.. And I used to have a bunch of small vintage travel trailers. Sounds like you're well on your way though! The caliper is only $20 from AZ. But the rotor will still be all tore up. Unfortunately it's a rotor/hub combo dealie with the bearing needing to be pressed inside. We'll see. My plates on the van expire in a week too but I haven't been wanting to renew because I was hoping I'd get rid of the van. 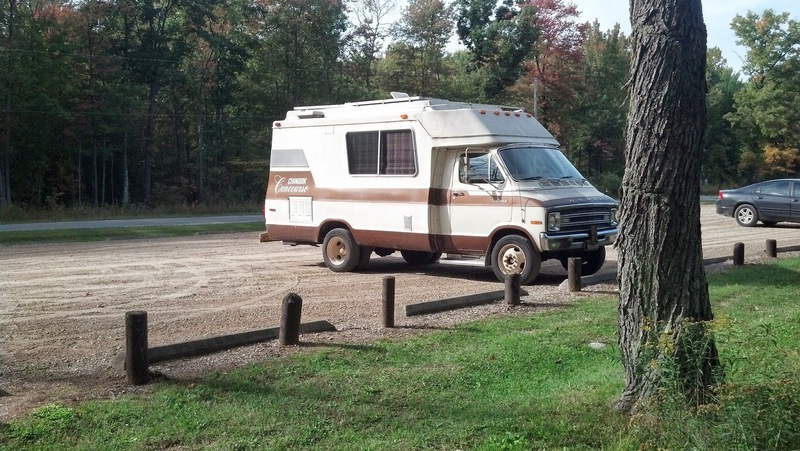 I don't want to pay for another year (a little under $100) if I'm going to be off in the motorhome down south somewhere. Its one of "those" :o They are a nightmare to work on, I dont blame you for not wanting to get into it, I definitely retract my previous statement. Replaced the caliper yesterday so the tore up rotor should last me a while longer. It's good you've got a licensed carpenter helping you out. Haha, if it's anything like mine then you definitely won't hurt it any by cutting it in half. Mine was in one piece but still ended up at the scrap yard. Thanks for the support. My back and forth-ness is playing a big role again. And my fear of taking off and quickly running out of money. And lots of other things. In my current state of mind I figure I'll be sticking it out through the winter, but it'll change tomorrow. I was driving it Tuesday and suddenly the oil pressure gauge dropped to 0 for a while and eventually went back up, but not much. So that has me worried. If it ends up being a real issue then that pretty much seals the deal for me sticking around here. I put a new oil pressure switch on it yesterday and changed the oil today. It was a quart low. Just running it in the driveway shows things okay but I won't know until I drive it around again. Supposed to rain for days and days, so it might be parked for a while. Not sure how well my wipers work.